To add a new entry, tap the icon anywhere in the app. These icons are located in multiple places throughout the app. Note: From anywhere in the app, when adding a new entry you will always have the option to add text, Star (favorite) an entry, add a photo, and/or choose which list to save the entry to. Note: In the iPad, tap List in the upper left corner to open main menu. Menu is open automatically on iPhone. 1. Tap in the upper right corner. Note: When adding a new entry from the main menu, a menu will open allowing you to choose which list to add the new entry to. 2. Tap Wants, Needs, or Thanks. Cancel closes the menu. 3. Enter text, add photo, and/or Star your entry. 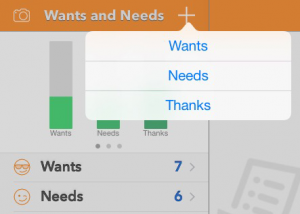 You can also change which list to save entry to: Wants, Needs, or Thanks. Note: The top line of your entry can be used as the title of the entry. It will appear bold once the entry is saved. The color of this line will also change to orange if the entry is Starred. Tap return on your keyboard to go to the next line. 4. Click Save in the upper right corner. 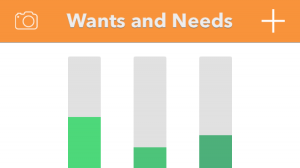 Adding a new entry from the Wants, Needs, or Thanks lists. 1. 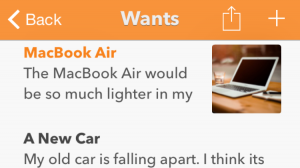 From the main menu, tap Wants, Needs, or Thanks to open a list. 2. Tap , in the upper right corner. Note: This will automatically create a new entry in the list you are viewing. The list can be changed on the new entry page. Adding a new entry from the Starred list. 1. From the main menu, tap Starred. Note: This is a combined list of all your Starred entries. 2. Tap Wants, Needs, or Thanks on the toolbar below the list. Note: This will open your Starred entries in their separate lists. 3. Tap , in the upper right corner of the menu. Note: This will automatically create a new Starred entry in the list you are viewing. The list can be changed on the new entry page. You can also unstrap the entry. 4. Enter text, add photo, and/or Star your entry. 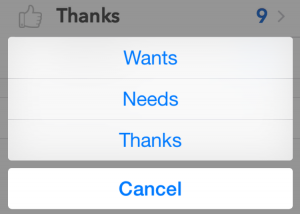 You can also change which list to save entry to: Wants, Needs, or Thanks. 5. Click Save in the upper right corner.